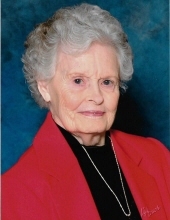 Nell Leggett, 93, of Purvis, passed away Monday, January 21, 2019 at Merit Health Wesley Hospital. Funeral services will be held at 11:30 A.M. Thursday, January 24, 2019 at the Purvis Chapel of Moore Funeral Home with interment in Cherished Acres Cemetery to follow. Nell was a member of Main Street United Methodist Church for sixty years prior to her joining Purvis United Methodist Church. While working as an RN at Vicksburg Hospital, she cared for a young veteran home from WWII. They later married and remained a loving couple for seventy-two years. For enjoyment, she loved to pick blackberries and make jelly for family and friends. Nell is preceded in death by her son, Edward Leggett; her parents, Grover and Ora Mae Harvill; three brothers, Young Harvill, Tom Harvill, Stafford Harvill; two sisters, Frances Harrison and Minnie Jim Bardwell. She is survived by her husband of seventy-two years, Charles Leggett, Sr. of Purvis; a son, Charles (Kathy) Leggett, Jr. of Hattiesburg; two daughters, Ann (Gerald) Dungan of Purvis, Ruth (Steven) Mossor of Purvis; a brother, John (Dorothy) Harvill of China, TX; a daughter-in-law, Leasa Leggett of Athens, GA; seven grandchildren, Emily (Ron) Cosmore of Bonaire, GA, Matthew (Wendi) Dungan of Purvis, Lyn (Sam) Napier of Ocean Springs, Trey (Angela) Leggett of Silver Spring, MD, Ashlea (Kevin) Lane of Athens, GA, Jed (Lauren) Leggett of Purvis, Rachel Mossor of Purvis; and nine great-grandchildren. Visitation for Nell will be 9:30 a.m. until service time on Thursday, January 24, 2019 at the Purvis Chapel of Moore Funeral Home. At the request of the family, in lieu of flowers, memorials may be directed to Homes of Hope for Children, 344 Harold Tucker Road, Purvis, MS, 39475. To send flowers or a remembrance gift to the family of Nell Leggett, please visit our Tribute Store. "Email Address" would like to share the life celebration of Nell Leggett. Click on the "link" to go to share a favorite memory or leave a condolence message for the family.